Settling into watching Richard II in glorious HD on the BBC last night it was difficult to ignore the Beeb’s previous ill-fated attempts to engage with ‘the Bard’. Whilst Civilian Theatre has a better opinion than most of the BBC’s attempt to film all the Shakespeare plays; where else could we see an Othello with Anthony Hopkins and Bob Hoskins as the leads, or a young Helen Mirren playing Rosalind in As You Like It and Imogen in Cymbeline – it is still hard to avoid the criticisms of wobbly sets and at times really duff stage-to-screen acting. However the BBC’s reputation has been pulled significantly out of the mire after their last two adaptations of acclaimed stage productions – Tennant’s Hamlet and Stewart’s Macbeth- received sensitive transitions. Goold’s Macbeth in particular had a visual style that was magnificently assured given his background as a stage director. So hearing that he had been tasked with opening proceedings with Richard II did a lot to calm the nerves. This calm was only reinforced by the sweeping shot across Richard II’s court; Ben Wishaw as Richard; Patrick Stewart as John of Gaunt; Rory Kinnear as his son, Bolingbroke; the two David’s – Suchet and Morrisey – as father and son of York; and James Purefroy, steaming under armour as Mowbray. It goes without saying that once such accomplished actors are placed in position then there is little left to do but let them unfurl Shakespeare’s glorious language. Richard II, compared to the rest of the history plays, is difficult. It has less of the cartoonish villain that makes Richard III such a crowd-pleaser; it lacks a comic core of Falstaff or the jingoism of Henry V. It is a wordy play about a poor king and bitter nobles. To make it worse Shakespeare, as a stylistic tic, vastly increases the amount of rhyming verse. For those untrained in plays of the era the language is often perceived to be a barrier – and Richard II does risk encapsulating everything that people think they dislike about Shakespeare – it is difficult, unnatural and can be hard to follow. Goold and the cast respond to this challenge magnificently. For perhaps the first time we see that TV could have the edge of stage productions in some aspects. The history plays, far more than the tragedies and comedies, are complex, difficult and rely on a certain level of prior-knowledge that Shakespeare contemporaries would have had but that current audiences, for the most part, lack. The ability to zoom-in, jump-cut and provide proper location filming – sweeping landscapes and equisite interiors that provide a true sense of time and place – thus provides an essential element in driving the plot. No longer must we scan the faces of a court scene to decide who Richard is castigating, the camera does this for us. Some may cry foul but this is both good TV – no-one needs completely static shots – and also good for accessibility. It is a period location but that does not mean that modern stylistic devices shouldn’t be used. Goold deserves a huge amount of credit. This, and his Macbeth, were excellent adaptations that demonstrated he has a natural eye for balance and an assured touch. He may well work alongside a mighty fine cinematographer but having seen a number of his plays staged, it is clear that he has an innate understanding of composition and brings to the theatre filmic elements and here he proves he can work his artistry in reverse. The key to the play lies within Richard’s final speech, ‘Thus play I, in one person, many people, / And none contented’ [V.v]. Shakespeare presents Richard as a man who plays at being King, embodying the various kingly personas without actually being one. The tragic irony of the play is that Richard only learns to become king once he has been dethroned by Bolingbroke. Casting Ben Wishaw is an inspired choice – he has already given us a critically acclaimed Hamlet on stage – but as Richard he captures every element of his vacillations and makes clear, as he turns on a sixpence between his various masks, that he plays at all and embodies none. The audience see’s in death the deliberate, and possibly overdone, echoes of St Sebastian – the martyr king. There is the warrior king that, returning from Ireland, that draw on his subjects to defeat the rebels; there is the godly ruler resplendent in gold before yielding to Bolingbroke and there is the calculating ruler, susceptible to flatterers, who turns on John of Gaunt and on hearing him sick will state ‘Pray God we may make haste, and come too late!‘ [I.iv]. Some haunted by the ghosts they have deposed…‘ [III.ii]. Richard understands his position and understands the threat but still he acts the part of kings rather than becoming a king. Throughout the play the audience are given a sense that Richard is an intelligent man, but one who understands everything from the outside looking in. This is reinforced by the shattering of the looking glass at this dethronement. As Richard realises his physical visage has remained intact, the camera, in the shattered remains of the glass, captures Bolingbroke, standing regally as the anointed heir, looking every inch the true king that Richard could never be. 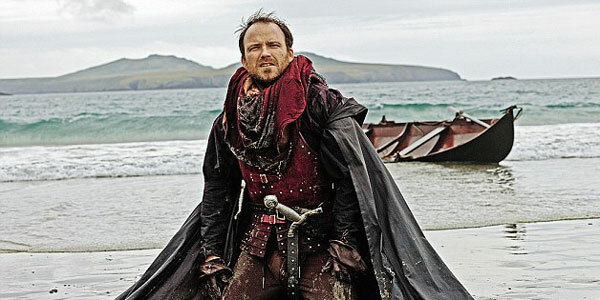 Balanced against Wishaw is Rory Kinnear (also with an acclaimed Hamlet behind him) playing Bolingbroke; a man who almost falls into kingship. Shakespeare sets Bolingbroke as the counterpoint of Richard. He is regal and earthy with the common touch. There is a deliberate contrast with his blunt prose set against Richard’s heightened verse and, whilst there is little in the part to play, Kinnear is every inch the image of the noble king in opposition. However Shakespeare leaves the audience with a little sourness as the real price of rebellion is shown in the final scene when the heads of Richard II’s associates are thrown in front of the new king. Here we see a hint of the Henry IV that is yet to come, that haunts the shadows of his own play – nearing death and seeing conspirators at every turn. 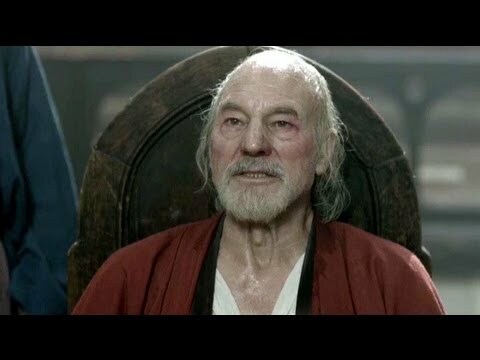 Patrick Stewart is predictably excellent as John of Gaunt. It is not a large part but it contains one of Shakespeare most-loved speeches; the mighty ‘’This royal throne of king, this scepter’d isle…’ [II.i]. The fame of the jingoistic elements of this speech- ‘this happy breed of men, this little world; / This precious stone set in the silver sea’ can make the audience forget that this is not a celebration but a heartfelt plea for what has been lost. Stewart makes us see what we may forget – that this is the bitter outpourings of a man who has spent his life serving England and god’s anointed choice only to see his son banished as his end draws near. There is bile and fury that inflect each syllable of ‘This land of such dear souls, this dear dear land, / Dear for her reputation through the world, / Is now leased out – I die pronouncing it – / Like a tenement of pelting farm’[II.i]. According to Gaunt, Richard is no true king, merely a man who watches over England’s lands like a landlord drawing money for his own ends. This was a superb production and rarely has Shakespeare and the history of England’s kings and men felt so alive. Civilian Theatre cannot wait until next week’s instalment (the most high-class mini-series imaginable) where we see what has become of Bolinbroke as King and the arrival of everyone’s favourite drinking companion, Fat Jack Falstaff (Simon Russell Beale).